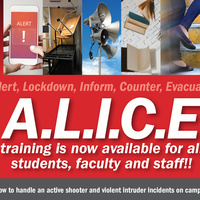 A.L.I.C.E (Alert, Lockdown, Inform, Counter and Evacuate) Training is now available for all students, faculty and staff!!! Learn how to handle an active shooter and violent intruder incident on campus. Register in the Student Life Office (MSS 209) or by phone at 216-987-4610. Space is limited, so register today!